What makes programming languages flexible and capable of handling every situation and programming challenge with a relatively small set of commands is the capability to examine external conditions and act accordingly. Programs aren’t monolithic sets of commands that carry out the same calculations every time they are executed. Instead, they adjust their behavior depending on the data supplied; on external conditions, such as a mouse click or the existence of a peripheral; or even abnormal conditions generated by the program itself. For example, a program that calculates averages may work time and again until the user forgets to supply any data. In this case, the program attempts to divide by zero and your program must detect this condition and act accordingly. 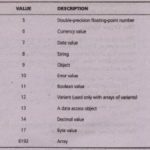 Visual Basic evaluates the condition, and if it’s True, executes the statement that follows. 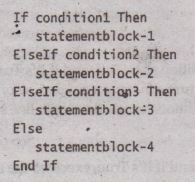 If the condition is False, it continues with the statement following the If structure. Some programmers prefer the multiple-line syntax of the If… Then statement, even if it contains a single statement, because the code is easier to read. the results would be quite unexpected. 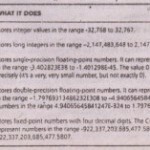 The code would (compare the score variable (49) to the value 75. 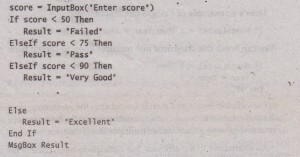 Since 49 is less than 75, it would assign the value “Pass” to the variable Result and then it would skip the remaining clauses. Thus, a student who made 49 would have passed the test! 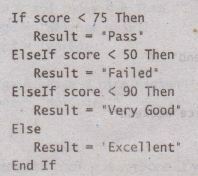 So, be extremely careful and test your code thoroughly if it uses multiple Elself clauses. An alternative to the efficient, but difficult-to-read, code of the multiple ElseIf . 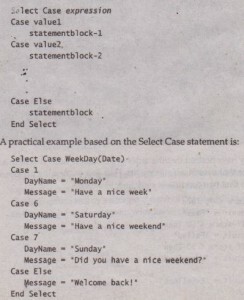 structure is the Select Case statement. The Select Case structure compares one expression to different values. The advantage of the Select Case statement over multiple If… Then … Else statements is that it makes the code easier to read and maintain. 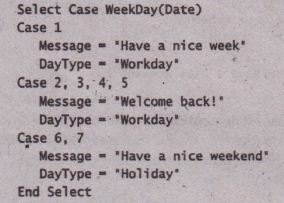 The five workdays and the two.weekend days are handled by two Case statements with multiple values. This structure doesn’t contain a Case Else statement because an values are examined in the Case statements. 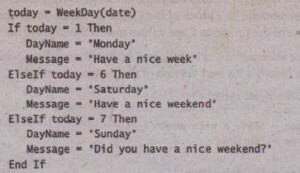 The WeekDay() function can’t return another value. Of course, the Select Case statement can’t be-substituted for any If…Then structures. The Select Case structure only evaluates the expression at the beginning. B. contrast, the If … Then … Else structure can evaluate a different expression for each ElseIf statement.